Product information "Anti-Mouse IgG HRP conjugated (Mouse TrueBlot® ULTRA), clone eB144"
Mouse IgG TrueBlot® ULTRA is a unique anti-mouse IgG immunoblotting (second step) reagent. Mouse IgG TrueBlot® ULTRA enables detection of immunoblotted target protein bands, without hindrance by interfering immunoprecipitating immunoglobulin heavy and light chains. It is easy to generate publication-quality IP/Western B blot data with Mouse IgG TrueBlot® ULTRA, simply substitute the conventional anti-Mouse IgG blotting reagent with Mouse IgG TrueBlot® ULTRA and follow the prescribed protocol for sample preparation and immunoblotting. Mouse IgG TrueBlot® ULTRA is ideal for use in protocols involving immunoblotting of immunoprecipitated proteins. Mouse IgG TrueBlot® ULTRA preferentially detects the non-reduced form of mouse IgG (IgG1, IgG2a, IgG2b, IgG3) over the reduced, SDS-denatured form of IgG. When the immunoprecipitate is fully reduced immediately prior to SDS-gel electrophoresis, reactivity of Mouse IgG TrueBlot® ULTRA with the 55 kDa heavy chains and the 23 kDa light chains of the immunoprecipitating antibody is minimized thereby eliminating interference by the heavy and light chains of the immunoprecipitating antibody in IP/immunoblotting applications. Applications include studies examining post-translational modification (e.g., phosphorylation or acetylation) or protein-protein interactions. 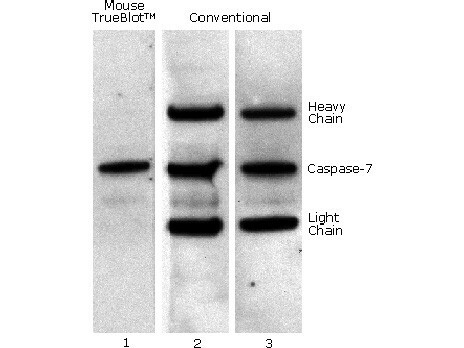 Mouse TrueBlot® ULTRA has been reported for use in immunoblotting (WB). Customer review for "Anti-Mouse IgG HRP conjugated (Mouse TrueBlot® ULTRA), clone eB144"